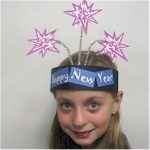 New Year’s Eve brings the old year to an end and opens up a whole new year for fun kid’s crafts. Make your own Crystal Ball with Bubble Wrap printing and start the new year right. Cut a large circle of bubble wrap. Spread newspaper to protect your surface from stray paint. Place bubble wrap face down in white paint. Then press on black construction paper. Let dry. Using large round can or small plate, draw circle in painted area. Cut out. Put small dab of tacky glue in the center of each bubble print. Holding bubble print over waste basket sprinkle lightly with silver glitter. Click on Printables and print out Happy New Year. Cut out and glue to black construction paper. Then glue on glitter ball beneath greeting. Get ready to watch the clock and celebrate the new year. 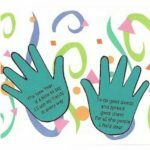 Want to have some creative family time? Print out our SudBudz® Masks and get crafty with the kiddos!More than just a typical Fizzy Bath Ball, SudPrize® is a first ever line of skin-loving and natural bath products that make bath time Fun for Kids and Easy for Moms. A Free companion App, SudBudz® engages your children into an immersive world of special and unique characters called SudBudz®. Thanks for another fun project idea!